HyperX Savage USB Flash drive offers blazing fast speeds up to 350MB/s (Speed may vary due to host hardware, software and usage) to save time during file transfers and let you quickly access, edit and transfer files from the drive without any performance lag. The HyperX Savage USB provides plenty of room for large digital files such as movies, hi-res images, music and more. It's compliant with USB 3.1 Gen 1 specifications to take advantage of USB 3.1 ports in desktops and notebooks and also backward compatible with USB 3.0 and USB 2.0. HyperX Savage is a stylish drive, with a sleek black casing and signature HyperX logo in red and an aggressive look. It's designed to work on multiple platforms and game consoles (Check with console manufacturer for support of this feature), including PS4, PS3, Xbox One and Xbox 360. Blazing fast transfer speeds - HyperX Savage delivers blazing transfer speeds of 350MB/s read and 250MB/s write to save time and let you quickly access files with no performance lag. USB 3.1 Gen 1 functionality - HyperX Savage is compliant with USB 3.1 Gen 1 specifications to let you take advantage of USB 3.0 ports in newer notebooks and desktops. Bold design - This stylish drive has an aggressive look that complements the latest PCs and consoles. 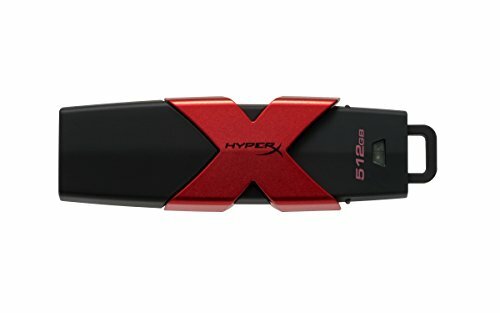 Its sleek black casing is accented with the signature HyperX logo in metallic red. Multi-platform compatibility - Use this versatile drive on multiple platforms, including desktops, notebooks and gaming consoles, including PS4, PS3, Xbox One and Xbox 360.